Orchids, amazing beauty, a plant. 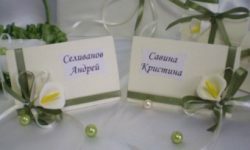 It is believed that this flower of love and sexuality. Color and shape are so diverse that it is simply impossible to describe. It grows not in the soil, but on other plants, most often in trees. Therefore, it requires special care and attention. 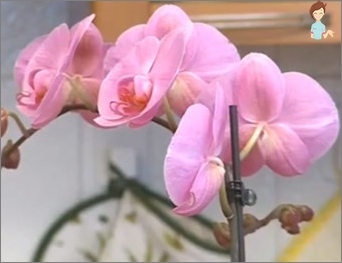 It is believed that caring for orchids is quite complex, requiring a lot of time and attention. But, despite this, with proper care, it will please you with abundant and bright flowering. There are a huge number of varieties and species of orchids. 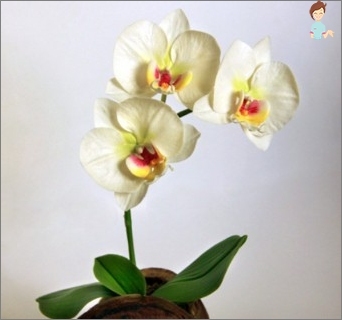 The most common type is the Phalaenopsis orchid. It is this species that is most adapted to the home conditions and does not require careful care; it is enough to observe several rules for their successful maintenance. 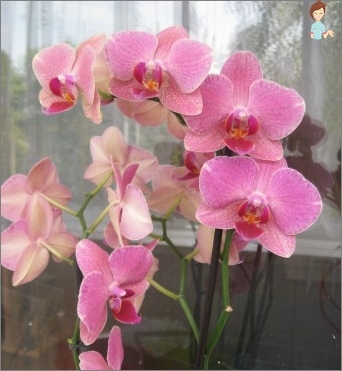 Flowers of the phalaenopsis orchid are like a butterfly, large and bright. They have oblong oval or slightly elongated leaves, a high flower-bud with buds. After you brought this beautiful flower to your house, first of all you need to give it time to adapt in a new place. Unpack it if there is a wrapper and leave it alone for a few days. It is good to think about the place of the flower, its light and humidity. Phalaenopsis does not like frequent habitat changes, so you need to choose a permanent place for it. Care for orchids, of course, is different fromCare for other plants. In particular, from the fact that this plant in nature grows not in the ground, but in the trees. In order for your pet to regularly blossom and be healthy, you must create certain conditions for it and observe several rules. First, let's talk about the root system of this flower. Phalaenopsis has thick roots, some of which are absorbed into the substrate, part is above the surface of the pot. This is necessary, since "Air" Roots need light and oxygen. Roots are very sensitive to moisture and fragile enough. A pot is preferable to take a transparent,Glass or plastic. 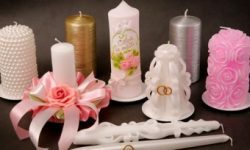 It is preferable to take plastic, since it is light and the condition of the roots is easily seen, which is very important for Phalaenopsis. Clay pots are not suitable for orchids, the roots of plants in such pots are tightly attached to its walls, and are injured during transplantation. In the pot must be an opening, so that the water does not stagnate, otherwise the roots will simply rot. The most important in the care of Phalaenopsis orchidsIs a moderate watering and a well ventilated room. The plant is very prone to rot and various fungi, so when watering it is important that water does not fall into the core of the orchid. Orchid refers to photophilous plants, butPrefers scattered light, direct rays of the sun. The midday summer heat can become destructive for her. 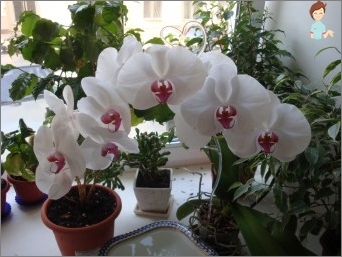 Therefore, if your orchid Phalaenopsis stays on the southern windows, in the hottest hours it is necessary to pritenyat. Otherwise, the plant will get burned leavesAnd roots. If the plant is on the northern windows, it needs to arrange additional lighting. Like any tropical plant, the optimum temperature for the orchid content is +20 (+25) degrees. Orchids like well-ventilated rooms, butBy no means drafts. In order for the orchid to regularly bloom, it is very useful to arrange for it to shake. The plant begins to bloom after experiencing stress. For the whole night leave the flower in a cool place, 15-18 degrees, and in the morning put in a warm, lit place and strengthen watering. Way: In a bowl, pour water and put a pot of orchid in it. Leave for a few hours. The plant will take as much water as it needs. Such watering will protect the plant from decay. Particularly afraid of moisture during irrigation is the middle of the orchid. It is very convenient to put a plastic pot with orchid in a ceramic or glass pot without holes, filled with 1/3 of water. Water should be at room temperature or slightly warmer. In warm weather, the orchid can be sprayed warmWater, avoiding the buds, and moistening the substrate. In the hot period of the orchid Phalaenopsis loves a warm shower. You can put a pot with a flower in the bathroom and pour from a warm shower. In this exercise, it is important to ensure that the water flows well from the core and does not remain between the leaves. It is better after such a shower to get wet leaves with a dry cloth. Transplant an orchid is every 3 years, inState of rest, slightly increasing the size of the pot. If you are going to transplant a newly purchased orchid, wait until it is blooming. The substrate for the orchid Phalaenopsis is composed of bark, peat and a few moss sphagnum, the content of the cortex in this case is 23. It is better to buy ready-made substrate, since it is already processed from pests, which can contain bark. If you can, you can make it yourselfSubstrate, then in this case the collected bark needs to be boiled for 15 minutes, dried and broken into pieces. Carefully shake out the orchid from the old pot, so as not to damage the roots. Scissors need to cut dry and rotten roots. It is necessary to remove as much as possible the old substrate from the roots of the plant. In the pot, place a little bark, then a little ground and sphagnum. The plant is placed in a pot, the space between the roots must be filled with a substrate, using a stick spreading it between the roots. Do not strongly immerse the orchid in the substrate, the core of the plant should be on the surface of the pot. For full bloom orchids should be fertilized. Fertilizers need to be used only for orchids, for other plants do not fit. Feeding is carried out once a week of flowering orchids and once a month the plants are at rest. In water for irrigation it is necessary to pour a little fertilizer and carry out the usual watering. 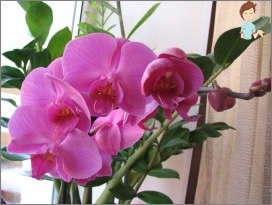 Do not fertilize the orchid with ordinary fertilizing for indoor plants. Phalaenopsis orchids most often reproduce by layers formed on an old peduncle from a sleeping kidney. But there are cases when the plant produces a new outlet next to the old one. Young sprouts are planted from the "mother" when at least 2 well-founded roots are formed. In greenhouse conditions, Phalaenopsis orchids are not often propagated by seeds. 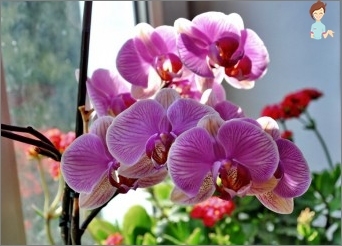 Frequent diseases of orchids are rot andFungal diseases. Therefore, the core of the plant should be protected from excessive moisture. Signs can serve as dark spots on the leaves, the decay and loss of the leaf. Similarly, Phalaenopsis orchids can be affected by spider mites and other types of mites. 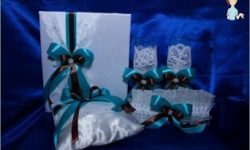 In this case, you can observe a silver coating on the sheet, cobweb or dark, sometimes red dots, which are smeared when pressed.